This article explains the step-by-step tutorial to Auto-generate & Email Australia Post labels with ELEX WooCommerce Australia Post Auto-Generate & Email Labels Add-On. For more information on the plugin, refer to the product page. Australia Post is an Australian-based postal service that provides services to send and receive parcels from Australia to different parts of the world. Although it caters mostly to domestic regions, it has suitable services for international shipping as well. It has services for personal, business, as well as Enterprise/Government packages. It has a varied type of services that can be availed based on the user’s requirement. This Add-On works only with ELEX WooCommerce Australia Post Shipping Plugin with Print Label & Tracking which allows you to access real-time rates from Australia Post, print shipping labels, track shipments, and helps in packing items into boxes. This plugin offers both non-contracted as well as contracted (eParcel and StarTrack) services. ﻿ Or continue reading the article. The core label printing process is determined with the ELEX WooCommerce Australia Post Shipping Plugin settings and not the add-on settings. Hence you need to set up the ELEX WooCommerce Australia Post Shipping Plugin first and then proceed with auto-generating shipping labels. If you are using StarTrack services, you can read its related article. Go to WooCommerce > Shipping > Australia Post > Auto Label Generate Add-On. There may be instances when a shipment fails to create. For example, the shipping service selected by the customer might fail to return any rates, the customer selects a default shipping method, or third-party shipping service other than the ones offered by the ELEX Australia Post plugin. Hence in such cases, the add-on will help you notify failure of shipment creation, via email. 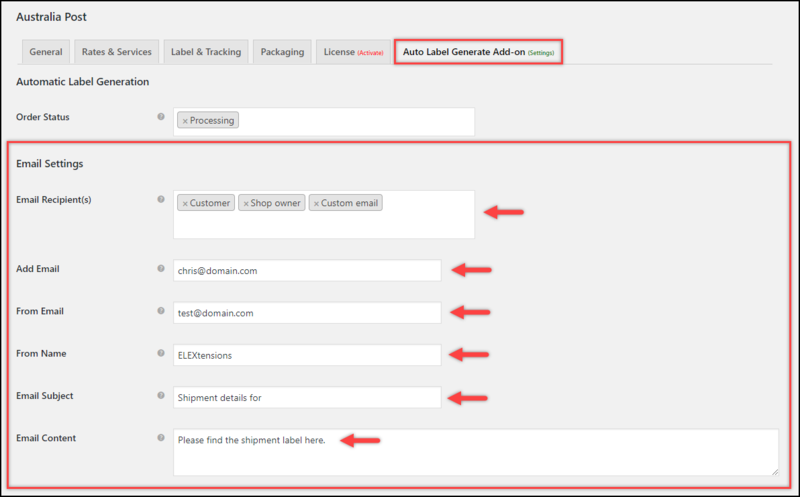 You can then go back to the respective WooCommerce order, create the shipment and generate the labels manually. When an order is placed successfully using USPS shipping service, the add-on will automatically create shipments using the ELEX Australia Post Shipping Plugin and notify the selected email recipient(s). A sample email is as shown in the below screenshot. 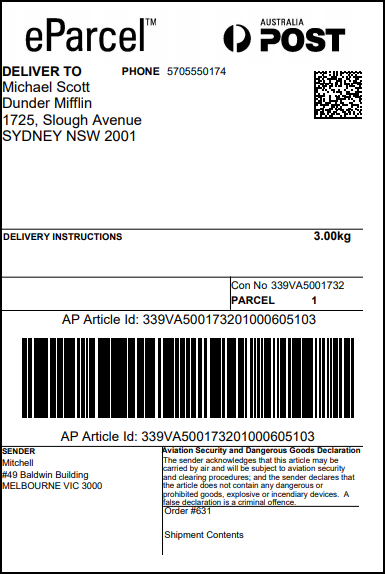 Below is a sample label generated by ELEX Australia Post Shipping Plugin. In this way, you can auto-generate and email Australia Post shipping labels with ELEX WooCommerce Australia Post Auto-Generate & Email Labels Add-On. To explore more details about the add-on, go check out ELEX WooCommerce Australia Post Bulk Label Printing Add-On. Or check out the main product – ELEX WooCommerce Australia Post Shipping Plugin with Print Label & Tracking and its product documentation for a better understanding of the plugin.